One extra special part of this time of year that I love is that it is a time focused on gratitude. 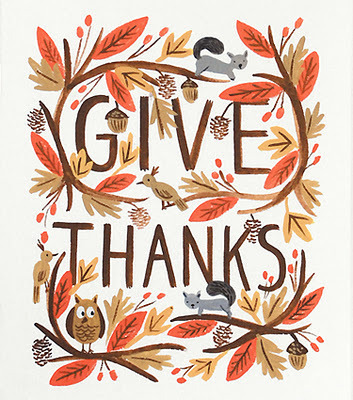 I wish there were holidays sprinkled throughout the year with the main focus of gratitude–but wait–hold on! There are! Valentine’s day–so grateful to have your love. Martin Luther King, Jr. day–so grateful for your nonviolent means of advocating for and gaining civil rights. Fourth of July–so grateful our founding fathers had the guts to stand up for freedom. Birthdays–so grateful you are alive. Mother’s and Father’s days–so grateful for you mom and dad! Thanksgiving–so grateful for family, friends, and food. Nice! A regular practice of gratitude creates a positive focus for your life. You get in the habit of looking for the good instead of focusing on the flip side–the stuff that detracts and distracts from your life. You focus on the abundance you already have in your life–instead of focusing on lack. What would it be like if you moved through the world on a daily basis with your mind fixed on thankfulness, on appreciation, on beauty and love? Your whole attitude and demeanor would change. Your health would change, your relationships would change, YOU would change. Knowing how powerful practicing gratitude on a regular basis is, the best way to start on a path of personal development and growth is to become grateful for the things that are already blessings in your life. It’ll help you along on your quest for financial freedom, the perfect weight and good health, and loving and connecting relationships–let your personal journey for self-fulfillment in these areas begin with gratitude. #1 killer of relationships? Negativity (a.k.a. lack of positivity which is essentially lack of gratitude and appreciation. See how I extrapolated that out?). Finances? Instead of focusing on the lack, focus on the abundance–even if all that you can say is that hey, I can pay my electricity bill this month! Weight–that’s a daily moment-to-moment endeavor to making good choices–healthy choices. It’s a shift to focusing on those foods and habits that will nurture your body and have you living a long, healthy life. You could be thankful for being able to see or to smell; to walk; to not be in a hospital during the holidays. You can be grateful to be alive–to have a chance each day to make the very best of life for yourself/your family/your partner. There’s so many wonderful things in this world–focus on those, not on the lack. Life is too short to be caught up in the lack in your life (life lack). For better results, practice gratitude on a regular basis.